We have been out of touch the past few days for no other reason than the fact we were spending our Christmas in Bali! We chose to do absolutely nothing but lie by the beach, read and sleep. It has been incredible and was much needed after traveling like crazy through SE Asia for a month and a half. We just put together our blog from our time in Myanmar, as well as our photos. Enjoy! Before we get into our time spent in Myanmar, we should take a moment to recognize the situation going on in the country right now. Just do a google news search for “Myanmar” and you can read all about it. We won’t get into specifics, but essentially there are widespread reports of ethnic cleansing by the Myanmar Army against the Rohingya people. We were very torn on whether or not we should travel to a country that has let this happen, no matter what the circumstances are. Furthermore, we were conflcted as to whether we wanted to spend our dollars supporting a government who appears to not be addressing it. No doubt, it is a very touchy subject and we were very unsure of what to do. At the end of the day and after a TON of research, we decided to go. We ultimately made that decision because we knew our dollars would have way more of an impact for the lives of those we met while traveling: taxi drivers, guides, restaurateurs, small business owners etc. Once we got on the ground we were certainly glad we made this decision. We never felt unsafe, or even close to anything dangerous, but it was always on our minds as we made our way through the country. Even after 10 days there, we still have no clearer picture on what is really going on in certain parts of Myanmar. We did notice though, that everyone on the ground seemed to help us go out of our way to NOT support the government all while saying the Western news outlets are “not accurate” in their reporting of the crisis...interesting. We started our journey with two nights in Mandalay, which is a city in pretty much smack in Myanmar’s center. We chose Mandalay first because: a) it is one of the main ports of entry into the country and b) because we knew we could drive from there to our next destination, Bagan. This was welcome so that we did not have to take a train, plain or boat (which is also possible). We hired a driver for 3 days for $130! His name was “Win” and he picked us up at the airport and whisked us to our hotel, before recommending to us a place to have dinner (a local joint with Myanmar-style BBQ and beer and a LOT of looks from the other patrons). The next day he took us all around the city seeing a Buddhist Monastery, the Royal Palace, various temples and the top-spot in Mandalay: The U Bein bridge. This bridge is the largest teak wood bridge in the world and easily attracts the most visitors. We walked the bridge mid-morning and would return for sunset, which was probably the best part of our time in Mandalay. We hired a rowboat to take us out on the water and experience the bridge as the sun was going down. Due to a lot of cloud cover we did not get to experience it in its full glory, though it was still fun to watch the sky change and watch all the different types of people using the bridge including monks, cyclists and tourists. It was a quick stop by our standards, but two nights was about right to see and experience Mandalay. We woke up early, had coffee and then Win took us on the four-hour drive to Bagan, which was a bit harrowing (including driving through a river, in his sedan). 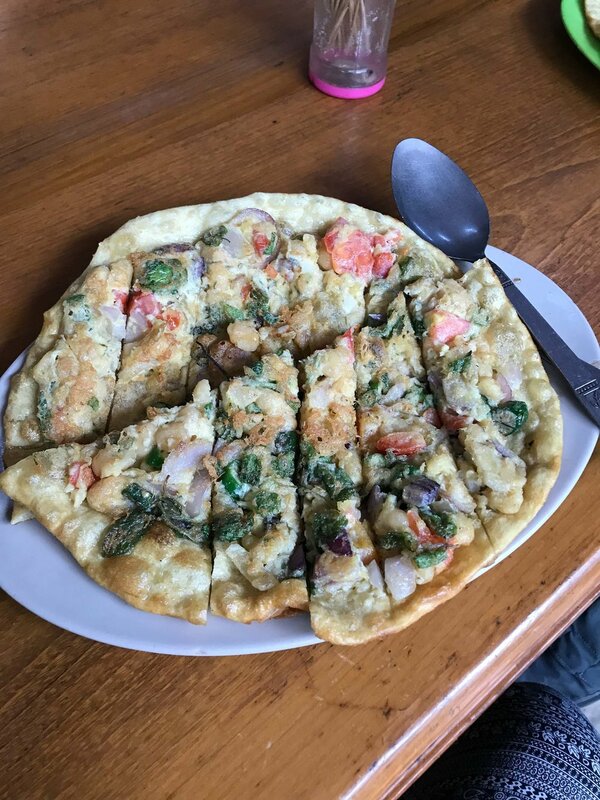 We stopped along the way for lunch where Win gushed that we had to try “the best pizza in all of Myanmar." We did, it was good, but it was not pizza like we are used to. He also spent much of the drive describing how amazed we would be at all the temples in Bagan and boy was he right! Win also spent a lot of time describing the political situation in Myanmar and where all the tax dollars went that were collected from tourists. Answer: no one really knows. We liked Win and appreciated his knowledge. We wished he could have stayed with us the entire time! Once we got to Bagan we learned the best way to get around was by electric scooter. It was basically a moped without a gas engine. We ventured out on our first night just to check things out and found a temple that had stairs we could climb to get a view and we gasped. Hundreds upon hundreds of temples were scattered in front of us; words simply cannot describe it. Bagan reminded us a lot of being in Africa. The landscape, climate and vegetation is similar, but instead of animals you see temples. Over our three days we operated like we would have on safari as well: getting up before sunrise, heading out to explore, returning for breakfast, napping through lunch and heading out again for sunset and nightfall. Of course the only issue with our specific Bagan adventure was that the weather was horrible! Rain and cloud cover prohibited any view of the sun whatsoever until (surprise surprise) our last morning. The morning before we were to leave we got what we had seen in all the internet photos: an iconic sunrise over the vast fields of temples, golden skies and hot air balloons! Yes, one of the coolest things about Bagan is about 20 or so balloons take flight for sunrise and slowly glide over the complex. Seeing the mist rise over the temples and the beautiful morning sky littered with hot air balloons was incredible and something we will never forget. This experience alone made it into our top-10 as we reflected later. Aside from the golden hours, just driving on the scooter through the open plains of temples is incredible. Oftentimes, we would come across a temple and be able to explore the hidden entrances, tunnels and corridors with no one else around! It really is a very cool place and makes the trip to Myanmar worth it if this were your only stop! From Bagan we took our first domestic flight to the Inle Lake area of Myanmar. Inle Lake is one of the largest lakes in Myanmar and is a totally different landscape and a way of life for all the locals that surround it. Floating villages, floating markets and fishing is the name of the game in this part of the country. In fact, our hotel was primarily on stilts suspended on a small section of the lake. However, the coolest part about the lake was getting to watch the local fisherman. The men use row boats and nets to do their job, but it is the way they work that is truly insane. The fisherman row their boats using a single leg, which frees their hands to work the nets. The best way to describe the action is to imagine a person performing ballet on water. The balance, strength and skill required truly make it an art form. Furthermore, watching them was the best display of the lifeblood this lake provides for those who live around it. Between Bagan and Inle, we felt our decision to visit Myanmar was fully justified and the memories would stick with us for quite some time! Nonetheless, we spent our day visiting the main attraction in Yangon: The Shwedagon Pagoda. This giant gilded Pagoda is a major religious site in Myanmar and was insane to see. It was easily the largest Pagoda we had visited and we watched in awe as people from all over came to visit, pray and spend time at the site. The pagoda is so large that it graces Yangon’s skyline, particularly at night when it is lit up and can be seen for miles. We also spent some time walking through Yangon’s night market and enjoying our final meal before heading out to southern Thailand. All in all, Myanmar was incredible. The people were insanely friendly, the culture was so interesting, the food was amazing and the diversity between the different areas of the country is amazing. We sincerely hope that the political issues can be resolved and if atrocities against humanity is indeed occurring, those responsible are held as such. We also hope that the country is able to keep protecting the beauty and tranquility as tourists continue to flock to the country (particularly the Temples of Bagan). We would highly recommend spending 10 days in Myanmar. This place is definitely guide-worthy and we will post one at some point. But in the meantime, please enjoy our photo gallery and Happy Holidays! !